One time, I heard a sound. A purring sound. I looked around and I found no cat. My ex and I never had one but we had a turtle. A red-eared slide turtle. It was my aunt who gave that turtle to me four years ago. Since no one and nothing was there I looked at it and I thought that I was just hearing stuff but then suddenly the turtle meowed again! The meow from the turtle is a soft meow. I was of course surprised and so I took my cellphone out of my pocket and turned the video recorder on and waited for the turtle to meow again. The turtle was staring at me and it looked like he was waiting for me to give him food. I sat on the floor with my camera prepared to catch the extra ordinary moment of my turtle. 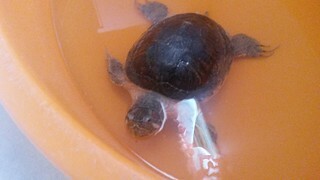 The turtle gave me that Wtf are you doing mommy look. But it did not meow again nor made any sound so I got a bit upset because I have not taken any proof that the turtle meowed. However it did not stop me from telling my mom and my ex about it. My ex did not believe me of course (Who would believe when someone tells you that a turtle says meow? ). Then I thought, maybe I was just exhausted and tired from work so I just told myself that I was just hearing things and my mind was just playing tricks on me.